Kids karate should be fun! Would you like to build self-confidence in your child, who is being bullied at school? Our karate kids learn to say no to bullying. Is there a fun and effective way to get your unfit child more active? Our fun, high-energy specially tailored kids self defence program will get them moving. Do you worry about how to focus your child’s energy and teach him self-control? Our world class instructors will guide him through fun karate games and drills. This will improve his concentration, focus, and ability to follow directions. Is it possible to teach a timid child how to stand up for herself? She can be taught confidence and self defence skills at an early age with the right encouragement from a skilled instructor in a fun kids karate class. Can you teach a child the importance of respect—for himself as well as for others? Our instructors stress the importance of giving everyone a fair go and treating others with dignity. 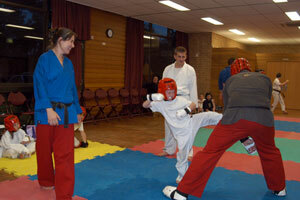 We highly promote use our kids karate skills in self defence only, and as a last resort. A positive adult role model is a very effective way to convey this philosophy. Are your children disadvantaged by being weak at team sports? Kids karate is not a team sport. Children that might not excel at team sports learn that they can be very good at a sport that is based on their own abilities, and that they can stand on their own two feet. None of our karate kids sit on the bench–their self esteem grows with each achievement, and this is carried with them throughout their lives. Australia’s Youth Self Defence Karate was created in 1994 to give children of all ages greater self esteem, confidence, and fitness through the study of martial arts. The founder and 6th Dan Black Belt Matt Klein, or “Sensei Matt” as his students call him, saw a great demand for fun and affordable karate classes for kids in Sydney, Australia. Our main focus is on building the self esteem of the child or teen and improving their self-confidence. We teach kids almost entirely—it is our specialty. All self defence classes are taught in a positive, non-intimidating, and fun atmosphere. Parents are welcome to stay and watch the classes—we have no secrets. Our convenient kids karate classes in Sydney are taught throughout the year in unison with the school terms. A grading held at the end of each term to build the student’s sense of accomplishment. The goals are very achievable and are set forth at the onset of the program. Please check out our list of kids karate locations/timetables in the Sydney area or feel free to contact us on (02) 9904 5667 for additional information.